Now that you understand the position concept we are going to expand on that by looking at the subject of which starting hands to play and which to throw in the muck. This is the area where inexperienced players become fish, simply by not having the ability to fold weak hands before the flop. You can save a lot of money at this stage of the hand just by simply choosing not to play. As you know Poker is a game of maths and probability. It is therefore possible to know which starting hands are most probable to win a hand and this has been statistically proven in many studies. These studies have been able to rank starting hands according to how likely they are to win the hand against a random selection of opponent’s starting hands. 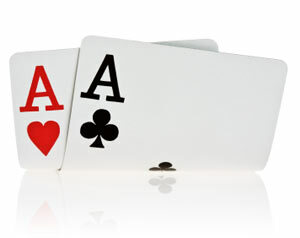 By Starting Hand we mean the two hole cards which are dealt to you at the start of each hand. Since we now know which are the best starting hands in poker then we can apply this knowledge to our strategy. Remember, when we play a hand, we want to play with the odds in our favour, and by selectively choosing which starting hands we play we can ensure this. Of course if we just waited for the two or three best poker starting hands then we wouldn’t actually play many hands as the probability of these cards being dealt is only once in a while. So we combine the position concept with our starting hand concept, to allow us to only play a narrow starting hand selection when out of position and to play a wider range of starting hands when we are in position. Therefore the benefit of playing in position makes up for the weaker starting hands we may play. You could look at all the statistical information and studies, but we’ve taken all the work out of it for you. The following section is a key part of your strategy and you should practise choosing the right action before the flop using the poker starting hands chart below. We have chosen 46 different hands that we will play depending on the position and situation we are in. 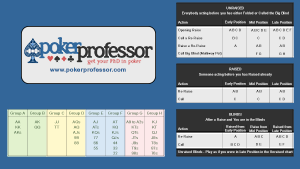 Those 46 hands have been separated into 8 groups named Group A to H. Group A are the strongest hands in poker based on the statistics and group H are the weakest hands that we are willing to play. Of course there are many more hand combinations weaker than the hands in Group H, but we are not interested in playing with these and they will be folded into the muck straight away. Take a minute just to browse the hands in each group, you don’t need to memorise these, as you can use the chart to refer to, and once you have used it for a while, you will start to remember which hands are in which groups. Ok, so now we have our selection of 46 hands, and have split them into 8 groups based on strength, now what? Well we won’t just automatically play any of those 46 hands when they are dealt to us, we will make a decision based on the position we are in, and the situation we are faced with at the table. When we are in position we will play a wider range of groups and out of position we will only play the stronger groups. Similarly when opponents have shown strength at the table by raising we will only play the better cards against them. There are three charts, UNRAISED, RAISED and BLINDS. These are our Action charts, and show us what action to take when we have a hand in one of the starting hand groups. UNRAISED – When everybody acting before you has either folded or called the big blind. RAISED – When somebody acting before you has raised. What group is your starting hand in? if it isn’t in any group then you Fold. What Situation are you in? Choose one of the three action charts relevant to the situation you are in. What Position are you in? 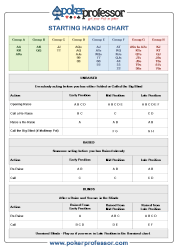 Look at the column in the chart for the position you are in. Starting Hand Group not shown? If your starting hand group is not shown in that column, then you Fold. Starting Hand Group Shown? If your starting hand group letter is shown then take the action the chart is showing you. I don’t expect you to memorise all the starting hand groups and action charts. The way to learn them is by putting them into practise and then over time you will start to memorise them. But to start with, you can refer to the charts while you are playing. You can either just bookmark and pull this page up each time you play or we have a couple of other methods to make your life a bit easier. A neat and tidy, A4 size starting hand chart which you can print and keep in front of you for quick reference while you are playing. To download the Starting Hands Chart right click on the link and select save target as. It is a PDF file, so to view and print this you will need the free Adobe Acrobat Reader. If you don’t have this you can download it here. Use this as your computer desktop wallpaper. It is designed so that whilst you are playing poker, you can place your poker table window over the Poker Professor logo and all the charts will be visible around the table. Neat huh! To download the Starting Hands Wallpaper right click on the link and select save target as. To set as your desktop wallpaper, right click on the file you have just downloaded and select “Set As Desktop Background”. The wallpaper is optimised for a desktop screen size of 1920×1080 as this is the most common. It should work with most other desktop sizes as well as windows should automatically resize it for you. Lets take a look at some example starting hands and walk through what the charts are telling you to do and what thought process to follow. You are sitting in early position and are dealt A J . You are first to act and so nobody has bet before you. So from the answers to the above questions we look at the UNRAISED Action chart, and look in the column for Early Position. You will see that Group E is not shown in that column so we are not allowed to play a Group E hand in Early position in this situation and so we would fold this hand. You are sitting in early position and are dealt A K . You are first to act and so nobody has bet before you. So from the above we look at the UNRAISED Action chart, and look in the column for Early Position. You will see that with a group B hand we are told to make an opening raise. So we would enter the hand by making a Raise (We will look at details of how much to raise later in the lesson). You are sitting in Mid Position and are dealt A A . A Player in early position has raised the pot up to 3 times the Big Blind. You are sitting in Mid Position and are dealt 9 9 . A Player in early position has raised the pot up to 3 times the Big Blind. So, again we look at the RAISED Action chart, and look in the column for Mid Position. You will see that we are not allowed to play an already RAISED pot in Mid Position with a group D hand. So we fold this hand. You are sitting in Late Position and are dealt 8 7 . Two Players acting before you have limped in and called the big blind. So, we look at the UNRAISED Action chart, and look in the column for Late Position. You will see that we are allowed to Call a Multi-way pot with a group H hand (multiple players playing the hand). As two people have already called and the blinds will likely also call we can call the big blind and play the hand. So we would call the big blind on this hand. You should mix and match the size of your raises to prevent your opponents getting a read on your betting patterns, but the above can act as a general guide whilst you get used to your new strategy. The reason to Raise more in Early position is because we are out of position and want to put as much pressure on our opponents as we can. How much should I Re-Raise? The reason for this is it is more likely that a player in late position has raised with a weaker hand than a player in Early position. Well, that was a lengthy lesson and a lot to take in. Don’t worry, with practise it will start to become second nature, and that is exactly what you should do now with the first stage of your bankroll challenge.